Introducing the Core Bar Stool White, this subtle masterpiece is sure to shine in your kitchen or bar area. 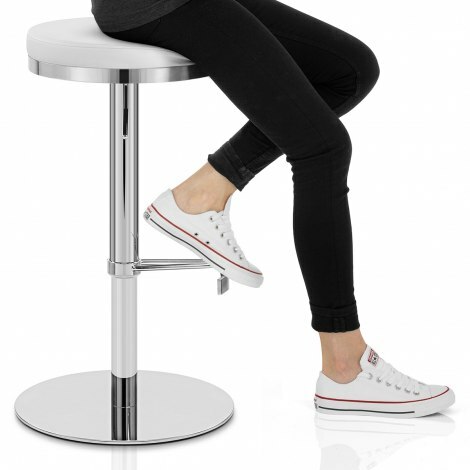 Clean, crisp, and contemporary, the Core Bar Stool is a compelling design with a comfortable yet space-saving appearance that is set to be a success. Covered in minimalist white faux leather, the round backless seat is compact in design, making it ideal for smaller spaces. In addition, the seat is edged with a glossy chrome rim for a stylish touch. Underneath, the slender column houses a gas lift mechanism that allows for variable height, whilst a 360-degree swivel enables rotation when seated. A distinctive T-bar footrest design is a functional feature that brings a unique detail to the silhouette. Weighted for excellent stability, the flat circular chrome base is complete with a protective underside to prevent any damage to floor surfaces.